Sleeping two, this beautifully appointed luxury Jr. Suite has a large bedroom with two double beds, comfortable seating area, full bathroom, kitchenette. Amenities include flat screen TV, Wi-Fi, DVD player and iPod dock. Private terrace with a Jacuzzi. 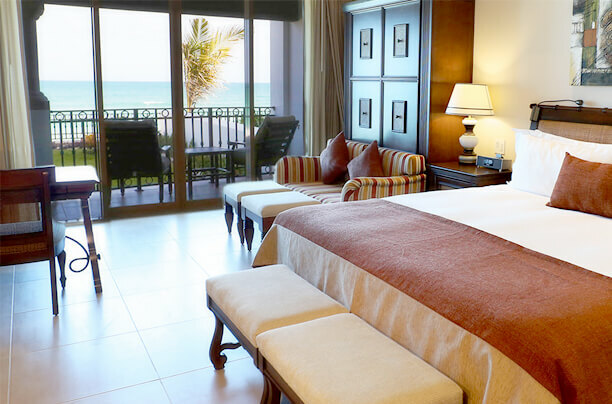 Relax in a luxurious ocean view Jr. Suite for two. The large bedroom has a king-size bed, comfortable seating area, full bathroom and kitchenette. Amenities include flat screen TV, Wi-Fi, DVD player and iPod dock. The private terrace is perfect for unwinding. The luxurious one-bedroom Master Suite sleeps up to five people. Features include a large bedroom with a king-size bed, gourmet kitchen, living and dining room with Murphy beds, a full bathroom and a laundry room. Amenities include flat screen TV, Wi-Fi, DVD player, iPod dock, home theater and upscale appliances. The private terrace has stunning ocean views. Elegant and spacious, the two-bedroom Master Suite sleeps up to eight. It has a large master bedroom with a king-size bed, comfortable seating area, full bathroom, a gourmet kitchen, living/dining area with Murphy beds and a laundry room. Amenities include flat screen TV, Wi-Fi, DVD player, iPod dock, Jacuzzi and upscale appliances. The large terrace offers spectacular views of the Caribbean. The Junior Suite has a king-size bed, bathroom, a kitchenette, terrace and independent access. Perfect for unwinding with family and friends, the three-bedroom Master Suite sleeps up to 10. The Master Suite has a king-size bedroom with sofa, desk and chairs and bathroom, a gourmet kitchen, living/dining area with Murphy beds, and a laundry room. Amenities include flat screen TV, Wi-Fi, DVD player, iPod dock, Jacuzzi and upscale appliances. The extensive terrace offers spectacular views of the Caribbean. Two Junior Suites have a bedroom, bathroom, kitchenette, terrace and independent access. The stylish penthouse Jr. Suite sleeps two in comfort and has a private terrace with fabulous views and a Jacuzzi. The large bedroom has twin double beds, full bathroom, kitchenette, flat screen TV and Wi-Fi. Secluded and luxurious, the penthouse Jr. Suite sleeps two and has a large bedroom with king-size bed, seating area, full bathroom, kitchenette, flat screen TV and Wi-Fi. Unwind in style on the private ocean-view terrace. The perfect blend of luxury and relaxation, the one-bedroom penthouse Master Suite sleeps up to five people and has a large terrace for outdoor living. Features include king-size bed, full bathroom, gourmet kitchen, comfortable living/ dining area with Murphy beds and a laundry room. Amenities range from flat screen TV, and Wi-Fi to a DVD player, home theater and iPod dock. The essence of gracious living, the two-bedroom penthouse Master Suite sleeps up to eight people and has a private roof garden with a pool, Jacuzzi, bar and grill. The Master Suite has a king-size bed, full bathroom, gourmet kitchen, living/dining area with Murphy beds and a laundry room. Amenities include flat screen TV, Wi-Fi, DVD player, home theater, iPod dock and upscale appliances. The Jr. Suite has a king-size bedroom, full bathroom, kitchenette, private balcony and independent access. The luxurious setting for an unforgettable vacation with family and friends, the penthouse three-bedroom Master Suite sleeps up to 10 people and has its own roof garden terrace, pool, Jacuzzi, bar and grill. The living space is divided into a Master Suite and two Jr. Suites, all with independent access. The Master Suite has a king-size bedroom, bathroom, gourmet kitchen, living/dining area with Murphy beds and a laundry room. Amenities include flat screen TV, Wi-Fi, DVD player, home theater, iPod dock and upscale appliances. One of the Jr. Suites has a king-size bed and the other has two double beds and an outdoor Jacuzzi. Both have a kitchenette, bathroom and a private balcony. 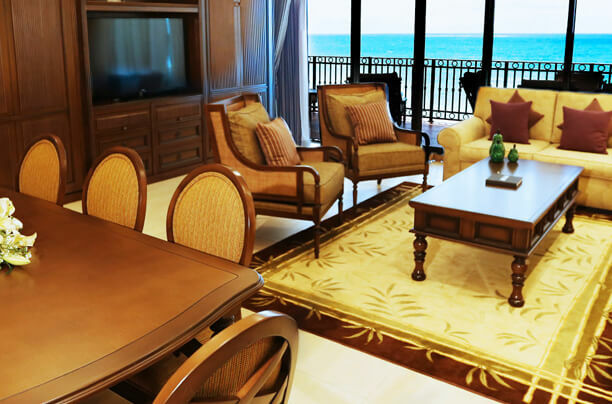 For a special family and friends get-together or a company trip, the luxury Presidential four-bedroom penthouse offers every creature comfort and sleeps up to 13 people. The private roof garden has breathtaking ocean views, a pool, Jacuzzi, bar and grill for entertaining. 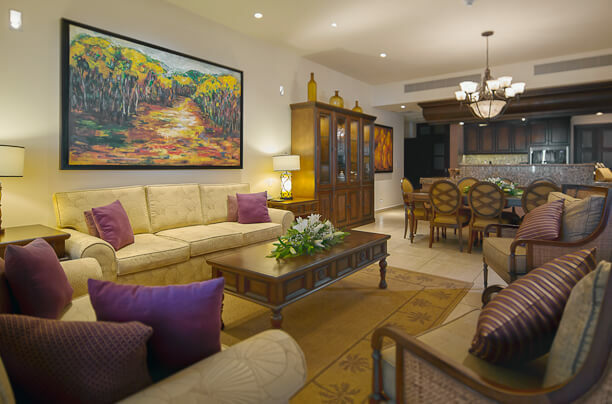 The living space comprises two Master Suites and two Jr. Suites, all with independent access. The Master Suites have a king-size bedroom, bathroom, gourmet kitchen, living/dining area with Murphy beds, laundry room and terrace. Amenities include flat screen TV, Wi-Fi, DVD player, home theater, iPod dock and upscale appliances. The two Junior Suites have a bedroom, bathroom, kitchenette and a private balcony.